GigaPan was highlighted in three booths during the science fair at the Internacional School of Aldeia (EIA) in Camaragibe - PE, Brazil. The theme for the science fair was I Like and I Share My Love for Aldeia. Aldeia is a neighborhood 15 km west of the city of Recife with a large area of well preserved Atlantic Forest. Mrs. Juliana’s 4th grade booth used a GigaPan image as a backdrop. This GigaPan was taken by a group of 6th grade photography students. 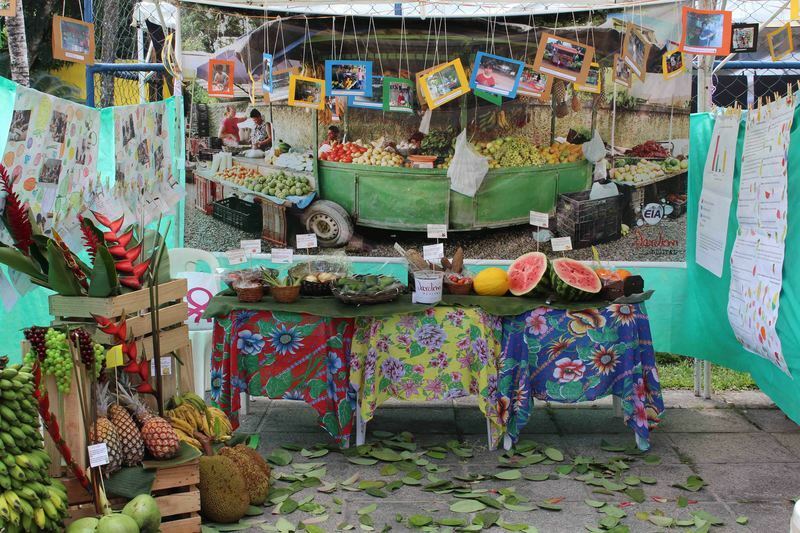 The image is of a fruit stand located about 100 meters from the school. The booth showed the importance of informal business in Aldeia. Mrs. Vivian used an image of a Cashew tree to represent a timeline of Aldeia. The fruits, which were represented by photos, were hanging from the large print. On the left branches of the tree, the images show Aldeia before its major growth and development, and the pictures on the right of the tree, were current images of Aldeia. The education gained and the experiences had, working with GigaPan and each other at EIA, is just the beginning. There are many more projects on the horizon. I was inspired by Keynote Speaker, Indira Nair. She discussed how technology at the root of the word means art and expression. She advised us that “shared language leads to shared understanding.” She also explained that technology education is “guiding [students] to thinking of and working in a bigger system with appropriate choices, ethics, languages, and voices.” Her stories about her teaching experiences were entertaining and endearing. She gave an example of a high school student who asked a speaker at the end of his presentation on algae, “Who cares?” Teachers in the audience gave a little chuckle and Indira explained how she quickly rephrased the question for the presenter, saying, “What Joe means is…” But she went on to explain how she thought the student’s question was “very, very deep.” This powerful example stressed the importance of making meaningful lessons. She shared how she would always “tell her students up front” what she was “trying to do” and that she “made sure her students CARE about and understand WHY” she was “trying to teach something and not just WHAT she was teaching.” She left us with the same words she delivered to her students at the end of her courses, “I hope you leave with more questions than when you came in.” I would love to have been a student in her class! We enjoyed a rainy Earth Day walk outside to CMU with a colorful umbrella parade. We were welcomed with hot coffee and dispersed to our choice of sessions or workshops. I enjoyed Riverpoint Academy teachers, Regan Drew and John Marshall, share examples of student’s using “real tools, to solve real problems, for real people.” I loved their way of introducing tools by leaving them out and allowing the student’s natural curiosity to lead them to learning about their uses and build on their own interests and talents. Robert Bandao and Rick Malmstrom, from the Ellis School had a dynamic presentation on teamwork with collaborative strategies for integrating technology in creativity ways. Their presentation included a cross-cultural exchange with a school in Brazil as an an example of showing how technology makes it possible to expand beyond the walls of your classroom. It was standing room only in the Tech Fluency Session, followed by a boxed lunch with a choice of sandwich, cookie, and the best potato chips, I ever tasted. I enjoyed sharing ideas about CREATE Lab and the GigaPan at lunch with some out of state educators who work at the collegiate level. 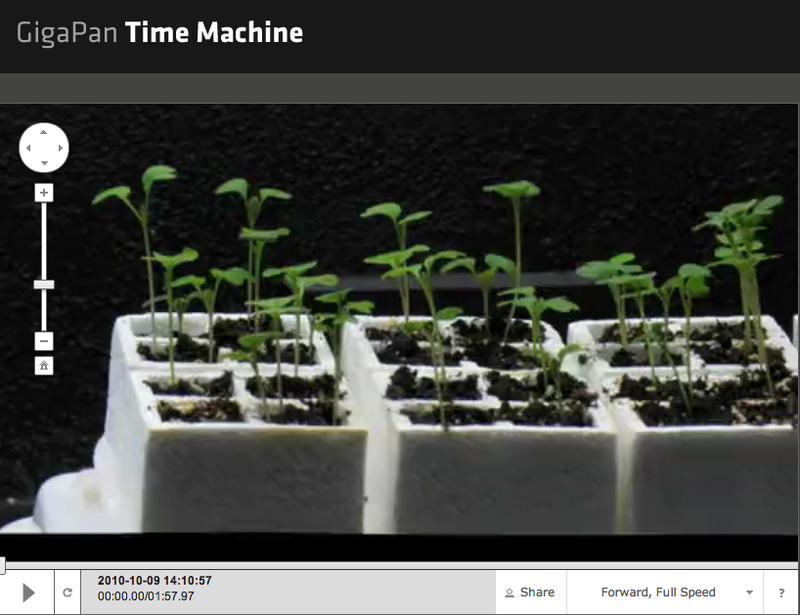 If you haven’t seen any GIGApans yet, check out http://gigapan.com/ as a resource for your classroom and look at http://www.cmucreatelab.org/projects/GigaPan/pages/GigaPan_Education for some great ideas for classroom use with CREATE Lab. The Context Clinic was a wonderful opportunity to visit different stations to learn about tech fluency from experts! There were teachers taking notes, brainstorming, sharing ideas and advice. 1. Be creative and follow your passion when looking for grant opportunities. 2. Look for that “shared language” that Indira Nair talked about in her Keynote. Take advantage of the resources and contacts that you have. 3. Be an innovator. Indira Nair also told us that “innovators, know one thing well, but can expand beyond it.” Look for opportunities to collaborate with other groups to make connections for support and for project sustainability. 4. If you don’t get what you need at the start, don’t be afraid to keep asking. Be positive, and ask someone else for support or help. 5. Say THANKS. Explain to the group who offered support how you will help share their message. Speak at conferences to share your work and spread the good news of your success. The conference was a great experience and a way to connect with some old friends and make new friends. Thanks to conference team, you did a fantastic job. Here is an Animoto with some photos from Wednesday at the conference. 16 Carnegie Mellon University students spent their spring break in Belfast, Northern Ireland as part of a new Art, Conflict and Technology course, a collaboration between CMU CREATE Lab, College of Fine Art and Department of English. Read more about the trip here or view their GigaPans here. I’m Lou Karas, Director of the Center for Arts & Education at West Liberty University. I’m here today with my colleagues from the CREATE Lab Satellite Network. With me are Dror Yaron and Rachel Hite from the CREATE Lab at Carnegie Mellon University; Stan Maynard and Carrie Beth Dean from the Harless Center at Marshall University; Jeffrey Carver from the College of Education and Human Services at West Virginia University and Jessica Meyers and Karen Savitz from ASSET STEM Education. Last fall, professor Illah Nourbakhsh the Director of CREATE Lab at Carnegie Mellon University’s Robotics Institute shared with the you the story and vision of the CREATE Lab and its Satellite Network. We’re here today to give you a brief update on the work of the CREATE Satellite Network in West Virginia. Over the past year, the satellite partners have worked, throughout WV with over 1,200 children, Pre-K through 12th grade and more than 700 educators, both teachers in the field and pre-service students at the three universities. We are empowering a technologically fluent generation through experiential learning opportunities in and outside of school. The technology is the raw material, a tool for a child to use to explore and address real world issues, to learn - and communicate - about their own environment and perspective. We’ve been able to take new technology tools from the desk of an engineer at Carnegie Mellon University’s Robotics Institute to the hands of a child in rural West Virginia, making them among the first to gain access to these innovations. Each of the Satellites not only provides training on the use of these technology tools but also, in many instances, is also able to lend the tools to teachers throughout the state. Over the past three years the CREATE Lab Satellite Network has grown from a partnership between the CREATE Lab and the school of education at Marshall University, to a network including Marshall, West Liberty, West Virginia University, and Carlow University as well as ASSET STEM Education. Each Satellite team adapts and uses the CREATE Lab innovations in a locally meaningful way with the educators and future educators they support. Similarly, working closely with the CREATE Lab, the Satellites bring their communities’ needs to bear on the technology innovation process. As the Satellite Network model of outreach is gaining traction and in light of its rapid growth, we recognize now is an appropriate time to invite more perspectives and stakeholders to the table, as we consider how to meaningfully direct and leverage the momentum and resources at hand. This has resulted in the formation of an advisory board that will meet for the first time later this fall at West Liberty. Message from Me enables young children to better communicate with their significant adults about their daytime activities at early childhood programs through the use of digital cameras, microphones, e-mail, phone messaging and other technologies. Originally developed using adapted computer kiosks, the program now uses an app developed for the i-Pad. The Harless Center has been at the forefront of using Message from Me in their Pre-K classroom and sharing their experiences with others around the state. The Children’s Innovation Project takes a broad interdisciplinary and integrated learning approach, focusing on creative exploration, expression and innovation with technology. Children explore and learn about electricity through hands-on engagement with a kit of components designed for young hands. Utilizing this learning, children disassemble toys, identify components and then repurpose and reconfigure these internal components into new circuits, empowering them with new relationships and understandings of their world. 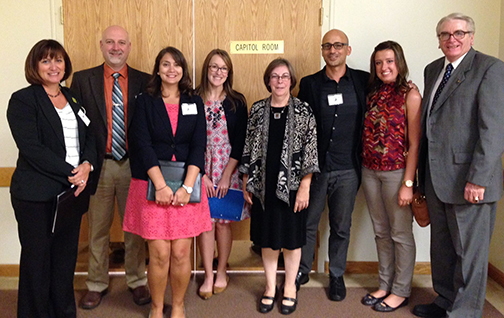 The Harless Center has also taken the lead in the use of the Children’s Innovation Project in West Virginia schools. In addition ASSET and Carlow University are developing professional development programs, which will be shared with the Satellite partners for their use. The third program is Arts & Bots. The Hummingbird robotics kit is designed to enable engineering and robotics activities for ages 10 and up that involve the making of robots and kinetic sculptures built out of a combination of kit parts and craft materials. Hummingbird provides a great way to introduce kids to robotics and engineering with construction materials that they are already familiar with. Hummingbirds have been used in nearly every aspect of the curriculum: teachers and students have completed Hummingbird units in science, art, math, history, english, drama, poetry, and character education classes. The kits have also been used in numerous summer camps, after-school programs and other community-based environments. The CREATE Lab had been awarded a three-year $1.5 million National Science Foundation grant to support the “Creative Robotics” project, an innovative program that introduces robotic technology into non-technical middle school classes. It is the intent of the research project is to identify and nurture students with an affinity for science, technology, engineering and mathematics (STEM). All 7th and 8th grade students at Springdale Junior-Senior High School in the Allegheny Valley School District outside of Pittsburgh and all 6th, 7th and 8th grade students in the Mingo County Schools — a total of 900 children annually — are using the robotic kits developed at Carnegie Mellon University. They will use the kits to complete at least one project or assignment each year in required courses such as health, earth science and language arts. The project also includes faculty members and pre-service educators in the schools of education at Marshall and West Liberty universities. We are working with CMU researchers to develop the curriculum and integrate the project into both existing and new courses for our students. GigaPan is an earthly adaptation of NASA’s Mars Rover imaging technology - GigaPan helps bring distant communities and peoples together through images that have so much detail that they are, themselves, the objects of exploration, discovery, and wonder. Using a small robotic device, point and shoot camera, stitching software, interactive online platforms and large-scale prints, GigaPan is enabling people to explore, experience, and share each other's world. 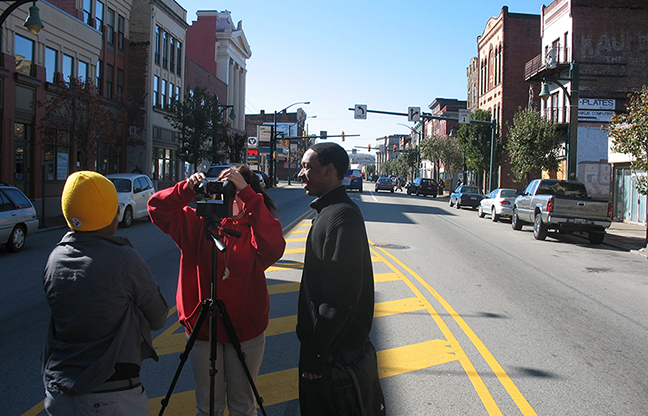 West Virginia University is working with North Elementary School in Morgantown, to train the teacher to both use gigpan images as well as generating their own gigapan images. 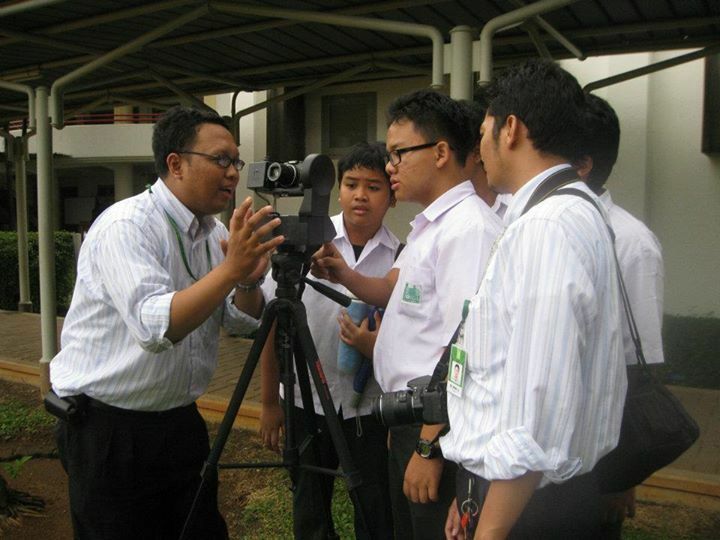 The technology integration of Gigpan is being conducted in and around the Garden Based Learning project at the school. The ability to take super high resolution images during the garden growing season and then utilizing those images during the non-growing months in the winter allows teachers to extend the garden based learning curriculum through the non-gardening months. At West Liberty, we have incorporated learning how to use the GigaPan images and technology into several courses in the professional education program. We are also working with the art teachers in Ohio County Schools supporting them in the integration of GigaPan into their classrooms. We have presented at conferences throughout the state included the West Virginia Technology conference and the West Virginia Art Education Association conference. The partners have provided opportunities ranging from GigaPan workshops lasting a few hours to weeklong Creative Robotics programs. It is important to note, that these programs are only the beginning of our work with teachers. 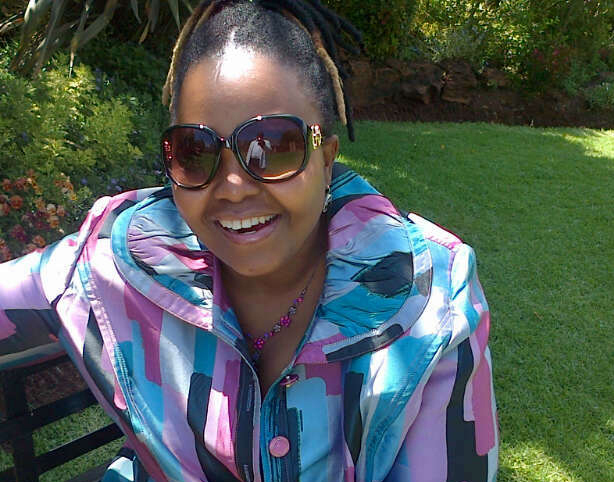 Each Satellite provides on-going support to the teachers. We are emphasizing the integration of the CREATE Lab resources into pre-service education because we believe it is important for our future teachers to learn these skills and technologies throughout their undergraduate years so they will be fully prepared to integrate them into their classrooms. ASSET, as our newest partner, will be involved in the expansion of this work. I would like to acknowledge the amazing work done by Debbie Workman, Carrie-Meghan Quick Blanco and Cathy Walker. They devoted countless hours building the programs and services of the first Satellite site at the Harless Center. Over the summer, Debbie and Cathy retired and Carrie-Meghan moved on to another position. Their enthusiastic support has helped the other two Satellite sites get off the ground. I would also be remiss if I didn’t acknowledge the support of Benedum Foundation and Jim Denova. Jim has not only provided financial support for our work but has also shared connections and given us guidance as we expand the Network’s programs and services. next spring, The CREATE Lab Satellite Network and The Sprout Fund are partnering to present the first annual Creative Tech Conference: Best Practices of Creative Technology in Education on April 21 through the 23 in Pittsburgh. The Creative Tech Conference will ignite productive dialogue and spur the exchange of ideas about the use of creative technologies (or creative use of technologies) in education, teaching, and learning. 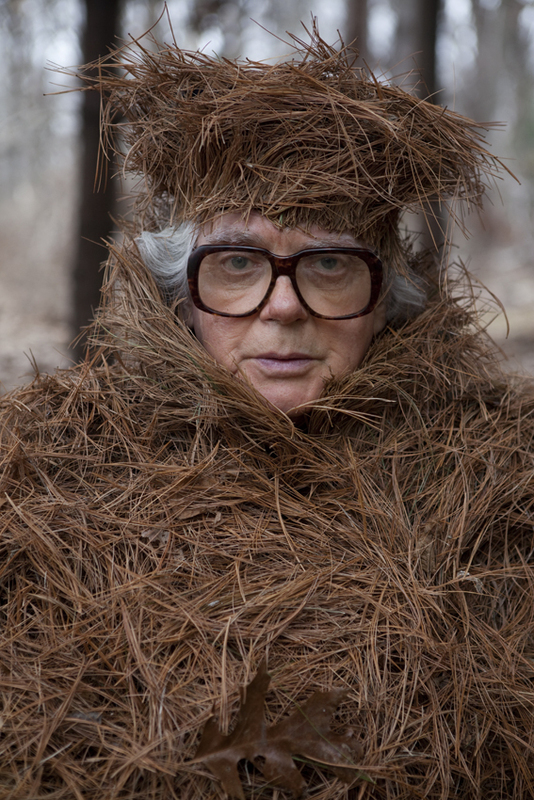 The conference will feature two tracks of programming: Practice and Ecosystems. The Practice track will feature educators sharing ideas and stories around their methods and experiences with integrating technology creatively and successfully into their classrooms and programs. The Ecosystems track will focus on discussions about the networks and conditions that support and empower meaningful technology practice in education. We hope you will consider joining us for the conference. In the mean time, we also invite you to visit us at Marshall, West Liberty and WVU to see the work of the CREATE Lab Satellite Network in action this school year. Lou Karas, Director of the Center for Arts & Education at West Liberty University. 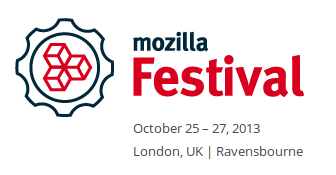 The CREATE Lab will be heading to London on October 25-27 to take part in MozFest 2013. Every year Mozilla brings together webmakers, educators and innovators from around the world who all share the aim to make the web more open and encourage people to become webmakers, not just consumers. CREATE will be showcasing Time Machine and will be focusing on the interactive Google Earth Engine Landsat Timelapse. We'll explore through space and time our changing planet and create and share tours about the last 29 years. On May 9, 2013, a collaboration between Google, NASA, the U.S. Geological Survey (USGS), Carnegie Mellon University (CMU), and TIME, releases what is possibly the most comprehensive picture of our changing planet ever made available to the public. 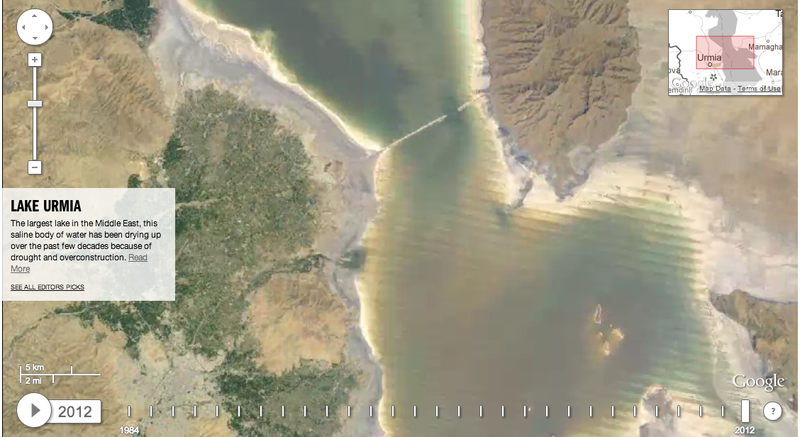 More than a quarter-century of satellite images of Earth, combined with Google Earth Engine technology, yields for the first time an interactive time-lapse experience of the global changes of the planet we all inhabit, contributing to a global environmental understanding. CREATE Lab projects were featured at the Allegheny Intermediate Unit's Center for Creativity for the grand opening of its transformED digital playground for educators on Wednesday. GigaPan and Arts & Bots were demonstrated to local educators by students. More about the event can be read at the Trib's website. Mt. 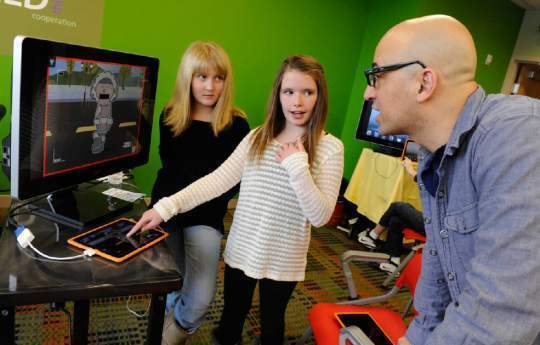 Lebanon School District fifth-graders Meghan Maselko and Maddie Ganoe demonstrate digital storytelling with Puppet Pals 2 app for an iPad to Carnegie Mellon director of outreach CREATE lab Dror Yaron during the transformED grand opening at the Allegheny Intermediate Unit headquarters in Homestead. Mito temples are among the earliest religious structures found in the Americas. Dating to the Late Archaic Period (3,000-1,800 BC), these buildings consist of single room enclosures with two level floors and central fire pits that served as the focus for ritual activities. Examples of Mito temples have been identified in the Central Andes Mountains and it is widely assumed that they date to 2,500-1,800 B.C. 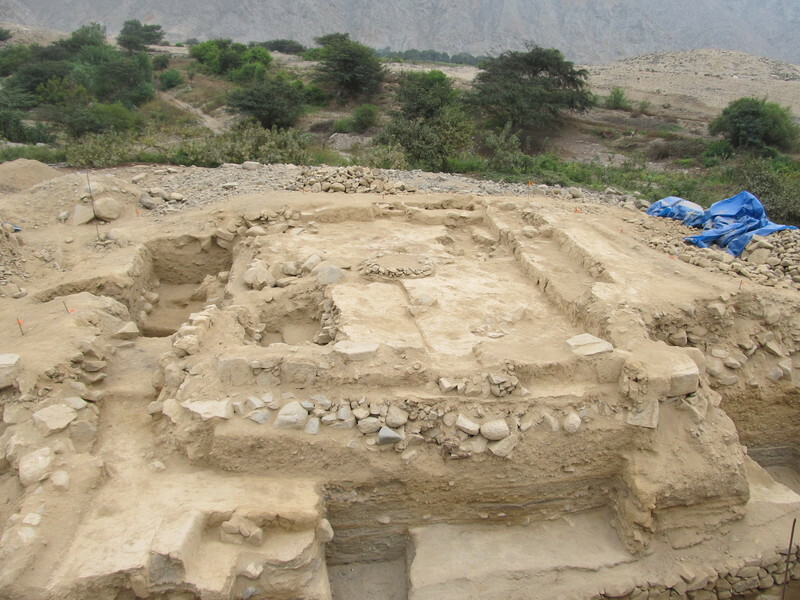 In 2007, researchers with the Proyecto Arquelógico Norte Chico (PANC) uncovered the remains of a possible series of Mito temples at the coastal site of Huaricanga in the Fortaleza Valley (Peru) that may be the earliest sacred altars in all of South America. This year, Carmela Alarcón Ledesma (PAURARKU, Centro de Investigaciones Andinas) and I have established the Huaricanga Archaeological Research Project (HARP) to explore these early ceremonial structures and to reconstruct the ritual activities that took place within them. If these structures are indeed Mito temples their early dates may rewrite our 40-year-old understanding of the origins of this architectural tradition and its associated religious practices. HARP is dedicated to applying innovative techniques to archaeological exploration. Continuing in this tradition, we have teamed up with the folks at Carnegie Mellon to bring GigaPan technology to our dig at Huaricanga. While perusing the GigaPan website it is easy to see the appeal for photographers. However, what can GigaPan do for the archaeologist? Archaeology is a lot more than finding interesting artifacts and uncovered long-buried architecture. Since it is a destructive process, the careful documentation of the ancient past is crucial to the discipline. Therefore, archaeologists spend most of their time sketching, measuring elevations, and most of all, taking photos. GigaPan offers the unique opportunity to capture panoramic views of entire architectural complexes, monumental mounds, or even excavation profiles, while preserving the smallest details. For our project we used the GigaPan robot to capture a stunning excavation profile that details the entire series of Mito temples exposed by our dig this field season. Please check out the amazing GigaPan here. This great idea was quickly dispatched once I realized that the platform on top of the ladder is too narrow to support the tripod, but I wanted to push further, “to infinity and beyond…” as Buzz Lightyear says. Not to be discouraged I looked around and told Carlos, our driver, to pull the truck over parallel to the canal. Just like an experienced city driver he pulled in as closely as he could. I mounted a large piece of plywood on top of the roof rack to serve as a base and I set up the GigaPan on top of the truck. To my surprise, the results were pretty impressive. You can view the GigaPan by clicking here. It is my hope that these initial GigaPan photos will inspire other archaeologists to more fully incorporate the technology into their work. GigaPan is not only useful for high resolution vistas of dramatic landscapes, but also as an explanatory tool to describe stratigraphy or even to document artifacts. While we may have to wait and see how gigapixel photography will impact the discipline, I am sure that Indiana Jones would be jealous of what we can do with GigaPan today.